More and more people are working remotely, working from home or on the move; this is a new world where information workers are not tied to a desk. We have designed Hornbill from the ground up with mobility and anywhere-always-on access so your workforce can work from anywhere and when they need to, safely and securely. Every collaboration feature you need is also accessible from our rich native mobile applications which are free to install and use for all Hornbill Collaboration users. Your co-workers are important to your day job so having access to your co-workers contact and profile information is critical. 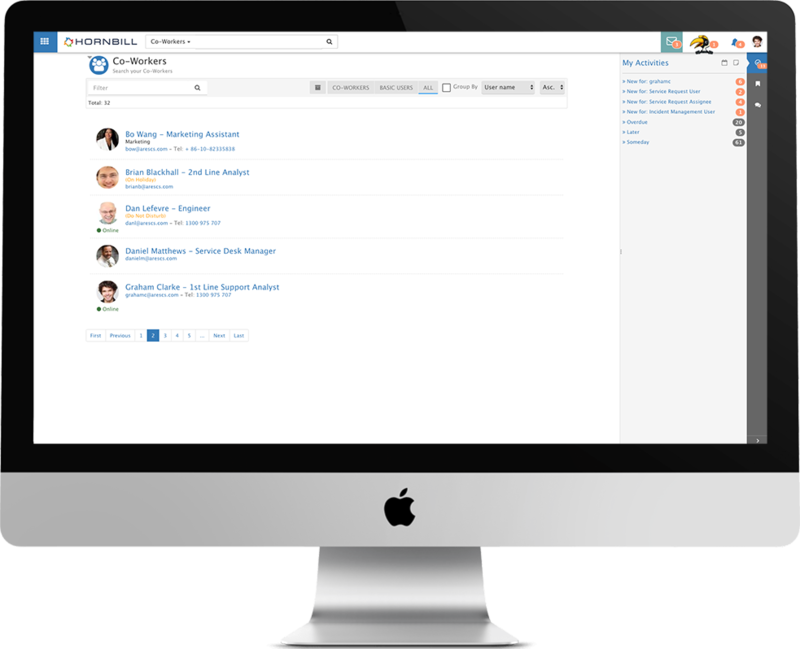 With the Co-Worker Directory you always have access to contact details for all of your co-workers in the palm of your hand. Today’s business environment is more culturally diverse, spanning many more languages and geographies. With international travel and trans-global communications more widespread and accessible today than ever before, the pace at which we can work with each other around the world has far outstripped the pace at which we have become a multilingual species. Our collaboration platform works globally and we have focused on creating technology to make it easy for people to communicate with each other from anywhere in the world even if they do not speak the same language. Central to any business application is the ability to co-ordinate and manage tasks, schedule activities and plan future work. 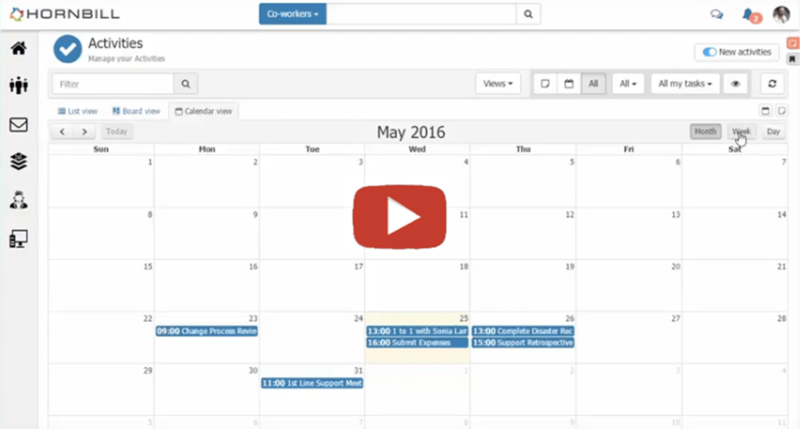 Hornbill Collaboration provides a rich set of functionality to help you organisation activities, manage and view team activities and calendars. 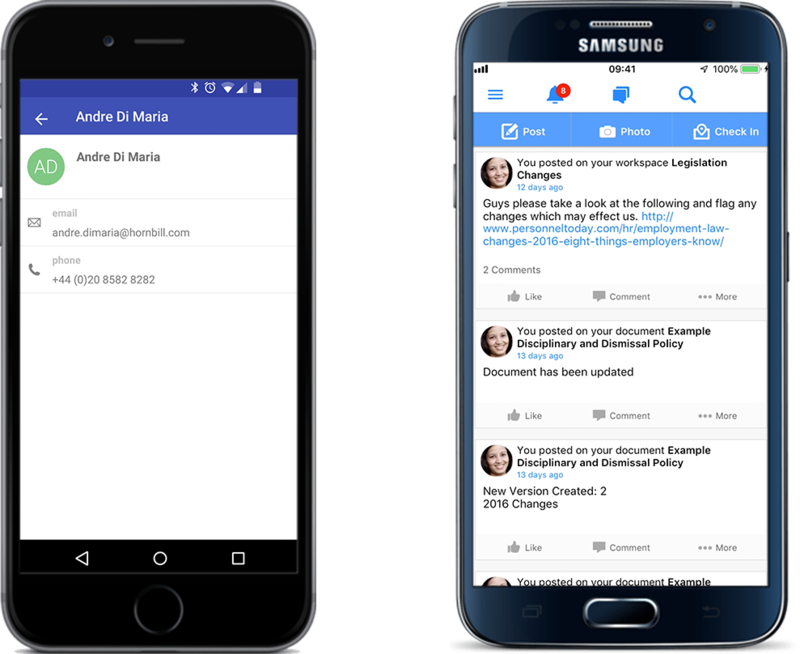 Access your tasks on the go on any device and from anywhere. Business Process Orchestration is built into the Hornbill Platform allowing automated orchestration of tasks and activities. Workspaces are the cornerstone of Hornbill’s collaboration solution. You can think of a workspace as a topic. Workspaces are easily created by your users, they can be secure so membership is by invitation only or they can be open so anyone can join the workspace and participate in the conversion. 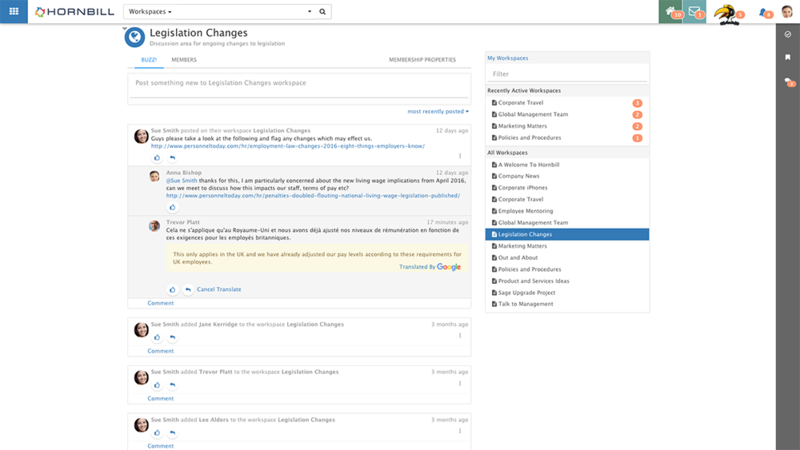 Target communications to specific individual using mentions while you type causing the user to be notified. Embedded Rich Media can be included in posts and comments, simply paste in an image or a URL to common services like Youtube, Vimeo, Prezie and may others to see the media embed conveniently and automatically. 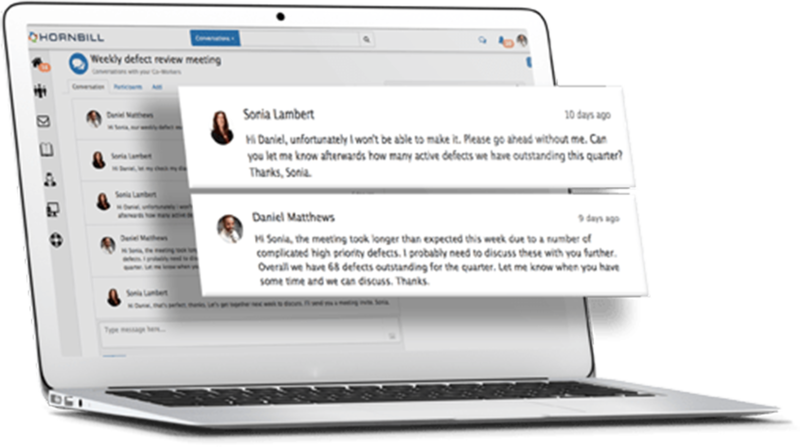 Conversations allow you to chat in real-time with your co-workers. One to one or group chats are both supported and you can post text and rich media content such as images and video. Embedded rich content including video and images. Supported on desktop (browser) and mobile devices. Keep a full history of all conversations. 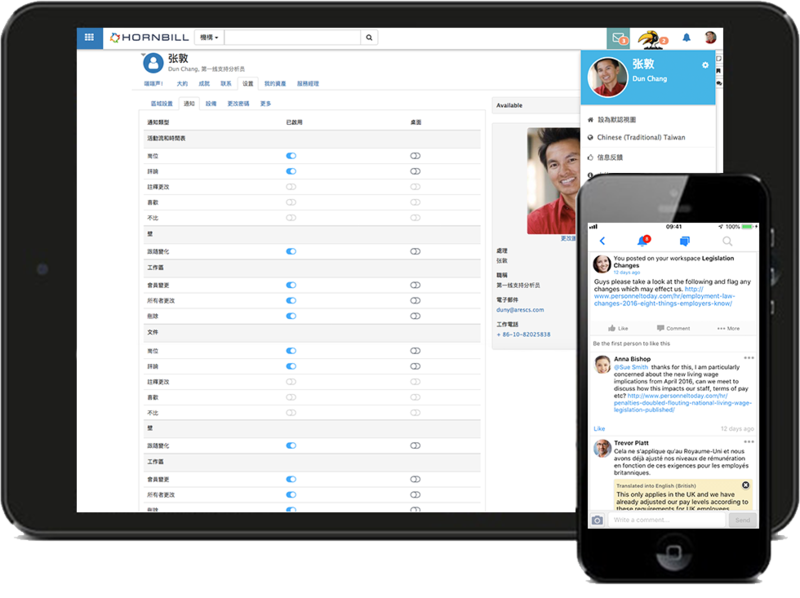 Hornbill provides a rich interface for managing email interactions with your internal users and external customers. 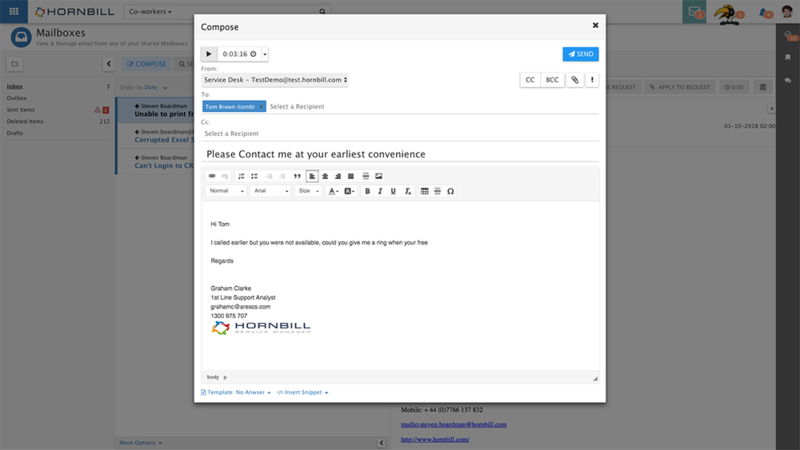 While integrating with your corporate email services, Hornbill includes the ability for you to create shared mailboxes and allow your team to manage e-mail anonymously or personally with all the features you would expect to find in an enterprise class e-mail solution.